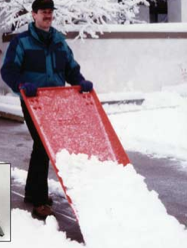 Testimonial for the Snow Scoop by Snowmaster: Hello, I just wanted to comment on the quality of your Snowmaster Snow Scoop. I have used this product for several years in my job. When it snows I have to shovel several sidewalks and steps to get children safely to school. The Snow Scoop has really helped me to do this in a fast and less tiring way. Thank you!